RTW Hosting will enable distributors to create NEW revenue streams for both new and existing software products, generating incremental recurring revenue and gross profit, but without impacting their current revenue streams and without the traditional overheads of setting up, running and managing a hosted platform. 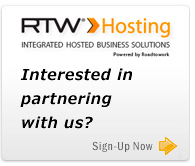 RTW Hosting are looking to expand its already growing channel partner base to meet the business demand from the rapidly growing cloud computing market, therefore, we are looking for value added distributors who wish to add hosting to their portfolio and win new customers and drive new incremental business into their existing customer base using RTW Hosting's unique integrated hosted platform and provisioning dashboard. Focus on selling applications ONLY, and NOT infrastructure!